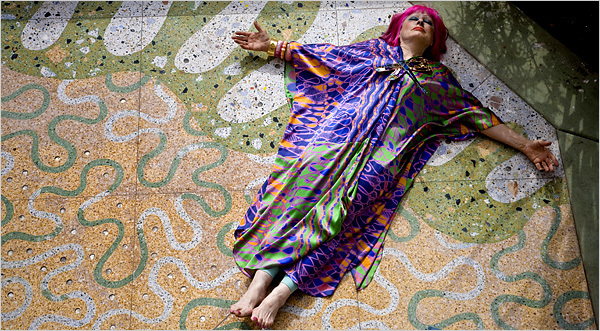 When El Nino storms battered the Californian coast during the winter of 1997, the ocean front residence of Salah Hassanein and Zandra Rhodes was extensively damaged. A massive sea wall, 12 metres high and 30 metres long, was constructed and provided the opportunity to redo the terrace in terrazzo. In order to materalise her vision, Zandra called upon her old friend, David Humphries, to collaborate with her on the creation of a 72 square metre terrace. David first met Zandra in the mid 1970's in London while he was doing postgraduate studies in arts administration. At that time Zandra was gaining recognition for her innovative and extravagant fashion design that would soon make her famous. Over the past 20 years, Zandra and David have collaborated on a number of terrazzo installations, such as the GlobalPlaza entrance to Harbourside Marketplace at DarlingHarbour,Sydney, and a series of exquisite limited-edition terrazzo tabletops. The union of the unconventional and idiosyncratic design philosophies of both artists is electric and inspiring. 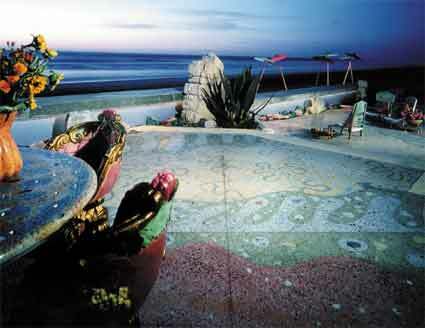 The results of this whimsical collaboration are now permanently set into the expansive terrazzo terrace of the Del Mar Beach House. 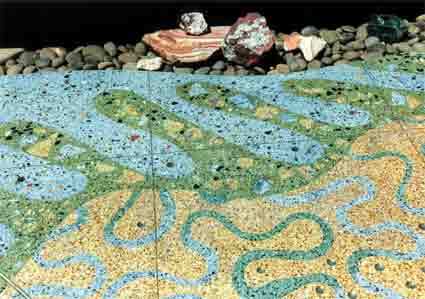 The beach environment and the rhythms of the sun, sea and sand are reflected in the design, which bears a flowing blue squiggle pattern of water over a base of sandy yellow and pink, inset with decorative elements of shells, marble mosaic, terrazzo shards and sparkling mirror. Zandra and David applied the magic of terrazzo in a unique way. Thousands of local beachgoers observed the creation of the terrace over the duration of the production and responded with a mixture of curiosity and delight at the brilliance of the final result - a triumphant tribute to the beauty of the beach itself.